A general and efficient method for the synthesis of drug-like fused bicyclic hydantoins is reported. 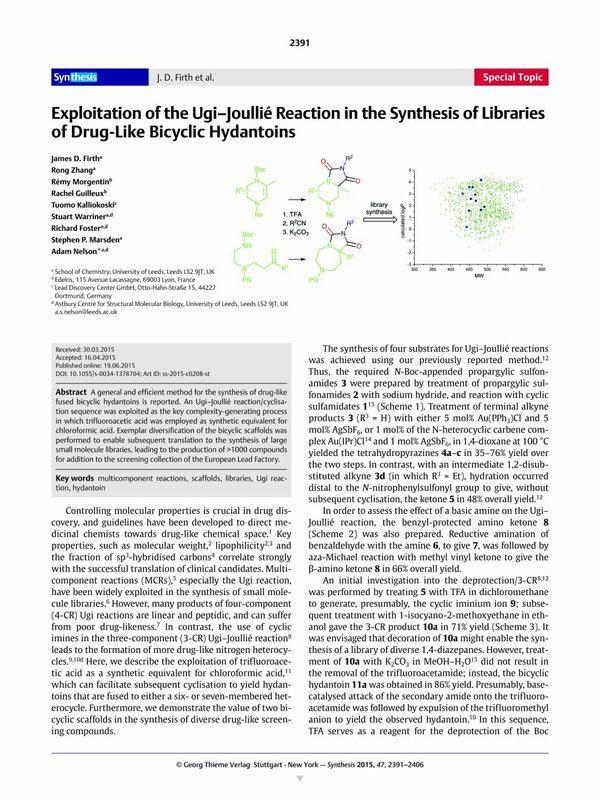 An Ugi–Joullié reaction/cyclisation sequence was exploited as the key complexity-generating process in which trifluoroacetic acid was employed as synthetic equivalent for chloroformic acid. Exemplar diversification of the bicyclic scaffolds was performed to enable subsequent translation to the synthesis of large small molecule libraries, leading to the production of >1000 compounds for addition to the screening collection of the European Lead Factory. Supporting information for this article is available online at http://dx.doi.org/10.1055/s-0034-1378704. 17 Use of EtOH as a solvent led to formation of a mixture of the desired trifluoroacetamides and the corresponding secondary amines; the presence of the phenyl substituent presumably slowed the Mumm rearrangement, which led to attack of the intermediate imidate by EtOH. 18 CCDC-1054376 (zwitterion 16) contains the supplementary crystallographic data for this paper. These data can be obtained free of charge at www.ccdc.cam.ac.uk/conts/retrieving.html [or from the Cambridge Crystallographic Data Centre, 12, Union Road, Cambridge CB2 1EZ, UK; fax: +44 1223 336 033; E-mail: deposit@ccdc.cam.ac.uk. 19a European Lead Factory; https://www.europeanleadfactory.eu/ Accessed 09/02/2015.